Here you can find some background information on the different types of illustrations offered by the Imagico.de Geovisualizations and the techniques behind them. My most popular products are 3d views. These are produced using raytracing techniques based on satellite data. They can be produced for any part of the earth and can cover anything from the whole globe down to closeup 'bird view' perspectives of small areas. Accurate representation of the earth surface geometry with correct depiction of the earth curvature at all scales. Realistic and consistent colors representing the appearance at close distance in both closeup and high altitude views. Accurate optical effects, especially shadows and reflections on water surfaces. Rendering of the Earth atmosphere with reduced density for a clear visibility at large distances but with realistic modeling of light scattering. The views are designed to show the earth surface with realistic geometry and coloring while eliminating the clouds that would usually be present in a photograph and reducing the density of the atmosphere significantly in comparison to nature. This way i create an impression comparable to that from close distance in nature while the perspective of the view is that of a more distant observer. Size and resolution of these views is only limited by the available data sources. Since the earth surface geometry is modeled with a special mesh free representation there are also no mesh artefacts visible in the images. Most of the catalog views are available in sizes suited for at least full or double page prints in very good quality. In many cases a view can be rendered for excellent quality printing in poster size. Production of 3d views relies on sophisticated satellite image processing to render accurate and uniform colors. The intermediate satellite image products are also available for licensing, like for example the green marble mosaic. 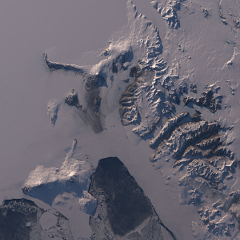 In many regions 3d views can be produced specifically to represent certain times of the year. Image data is also generally shading compensated so the lighting in the 3d view is not limited to the time the satellite image was taken. The different perspectives and other variants that can be produced are covered in a separate list. In addition to the different kinds of 3d views I assemble satellite images to seamless and cloud free moasics. In contrast to 3d views 2d satellite image mosaics have the advantage of a well defined coordinate system so objects can be precisely located in the image. Satellite image assembly is available with different processing levels. You can order an image with just basic color calibration, with atmosphere compensation representing the local surface reflectance and with atmosphere and shading compensation for use in 3d rendering with custom illumination. You can find some smaller Landsat mosaics of a number of areas in my catalogue as well as the Green Marble and the Landsat mosaic of Germany and the Alps. Apart from 3d views and satellite images i also offer classic maps as well as preproducts for map production. A collection of examples can be found on maps.imagico.de. Techniques available in this area include automatic generalization techniques, methods for relief rendering and relief data processing and orthographic 3d maps.